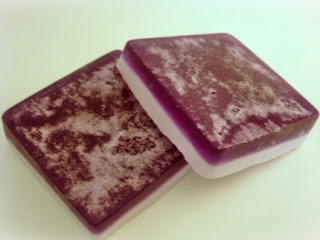 Barefoot Soaps is a relatively new Etsy shop that promises a little getaway in every bar of soap. It’s run by Kristin, a lady with more talent than many people I know. The soaps in her shop are pretty unique, and they are so lovely that if they didn’t smell so good, I’d just want to display them! The varieties that I personally tried are the blue glycerin, “Don’t Rain on My Parade,” and the very yummy “Vanilla Cuppie.” Don’t Rain on My Parade is a traditional glycerin, hand-poured by Kristen, who added a bit of iridescent sparkle, some vitamin E, and a Fresh Rain Scent. My husband and I loved the clean scent of this soap, and the glitter adds some fun. It washes away, so you won’t have to worry about finding bits of glitter everywhere after you shower! The Vanilla Cuppie was heaven. Krisitn is also a top-notch baker, so this cupcake-shaped soap was so much like the real thing. It’s a vanilla scented creamy glycerin with buttercream-scented “frosting.” It’s decadent to use, and the scent smells authentic, not fake or too sweet. Kristin certainly knows what she’s doing! 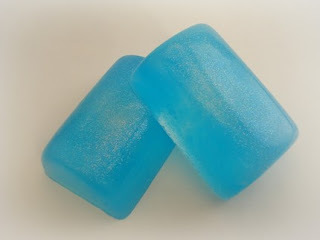 Barefoot Soaps offers a variety of scents and shapes, as well as massage bars, scrub bars, and bath fizzies. I have heard great things about her Cough & Cold Bath Fizzy in particular. She is also always adding new seasonal items, like the Bunny Soaps she had for Easter. Check her out for a decorative but functional gift or treat for yourself!